LEADING ASSISTS: Bulls: Dunn: 7. OKC: Westbrook 11. CCI RECAP: A huge second quarter scoring outburst by Paul George (16 of his 23 in the period) was all OKC needed as the Thunder turned up their D taking advantage of seven second quarter Bulls turnovers. On the night the Bulls committed 25 turnovers leading to 24 OKC points. 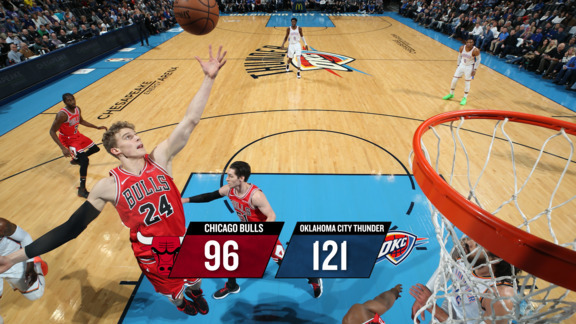 The game became rather “chippy” in the third quarter featuring a scrum of Russell Westbrook, Jerami Grant, Kris Dunn, Cam Payne and Robin Lopez. Lopez was ejected after picking up his second technical later in the period. Lauri Markkanen with his first 16-15 game as a pro. Jabari Parker missed the contest with a stomach illness. Zach LaVine remains sidelined with an ankle injury. CCI GAME BALLS: Bulls: Markkanen, Dunn, Rolo. OKC: George, Westbrook. UP NEXT: Home Wednesday with Brooklyn. Milwaukee 107 - Detroit 104. Giannis with 32-12-5. Blake Griffin 19-10-11 AND 10 turnovers. Portland 131 - Los Angeles Clippers 127. This was a wild one. In fact, the fourth quarter featured a combined 36 free throw attempts and took 45 minutes to play! Lillard with 39. Harris a career high 39 for LAC. Love what Shia Gilgeous Alexander is doing for the Clippers — a career high 24. This kid is a keeper. Phoenix 128 - New York Knicks 110. The Suns won their third straight game. Devin Booker put on a show at MSG scoring 38 points. Jamal Crawford dished out a career high 14 assists. The Suns parted company with Austin Rivers after completing a trade with Washington earlier Monday afternoon. Minnesota 132 - Sacramento 105. KAT 14-14 in only 21 minutes. The T- Wolves had nine players score in double figures. Houston 102 - Utah 97. James Harden scores 47 points - his sixth 40 point game of the season, tops in the NBA. Chris Paul says Harden is the best offensive player he’s ever seen. San Antonio 123 - Philadelphia 96. Aldridge, DeRozan and Gay combined for 61 points. The Spurs held an opponent under 100 points for the fifth straight game. San Antonio closed out a six game home stand at 5-1 with their only loss to the Bulls. Golden State 110 - Memphis 93. Steph Curry hit the 15-thousand career scoring mark. The Grizzlies have dropped three straight.